Our avg temps in winter in the 50's were warmer than now lol. Even our low temps. Avg winter min 9F, higher than now. Dec, Jan and Feb all had monthly mean temps warmer than 1981-2010. Bring it on cause I welcome it. That should make you very happy about next winter. The world gets warmer but our area gets colder lol. Last edited by tom77falcons; 05-16-2016 at 02:23 PM..
Just look at how ridiculously short the most recent cold PDO has been compared to the last one decades ago. And look how long the last warm PDO was. They seem due for a very long cold PDO. I am really hoping we flip back to sustained cold PDO sooner rather than later. Check out the PDO in July 1983. over 3.5! And there have been plenty of imporessie -PDO monthly indecies as well. Maybe the warming of the planet you talk about is the reason why the PDO went back to warm so fast. I also found this peer reviews article last night that I was reading, I didn't have a chance to post it. Atmospheric temperature time series for the nine climate regions of the contiguous U.S. are accurately reproduced by the superposition of oscillatory modes, representing the Atlantic multidecadal oscillation (AMO) and the Pacific decadal oscillation (PDO), on a monotonic mode representing, at least in part, the effect of radiant forcing due to increasing atmospheric CO2. 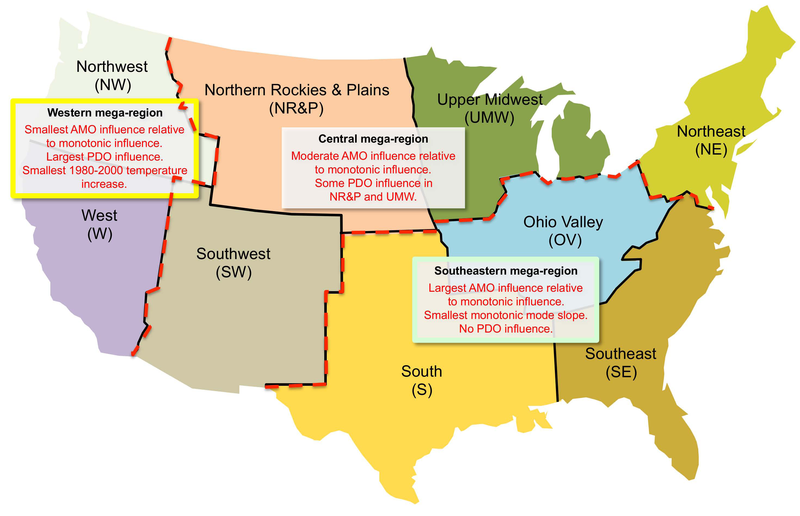 The relative importance of the different modes varies among the nine climate regions, grouping them into three mega-regions: Southeastern comprising the South, Southeast and Ohio Valley; Central comprising the Southwest, Upper Midwest, and Northeast; and Northwestern comprising the West, Northwest, and Northern Rockies & Plains. The defining characteristics of the mega-regions are: Southeastern – dominated by the AMO, no PDO influence; Central – influenced by the AMO, no PDO influence, Northwestern – influenced by both the AMO and PDO. Temperature vs. time curves calculated by combining the separate monotonic and oscillatory modes agree well with the measured temperature time series, indicating that the 1938-1974 small decrease in contiguous U.S. temperature was caused by the superposition of the downward-trending oscillatory mode on the upward-trending monotonic mode while the 1980-2000 large increase in temperature was caused by the superposition of the upward-trending oscillatory mode on the upward-trending monotonic mode. 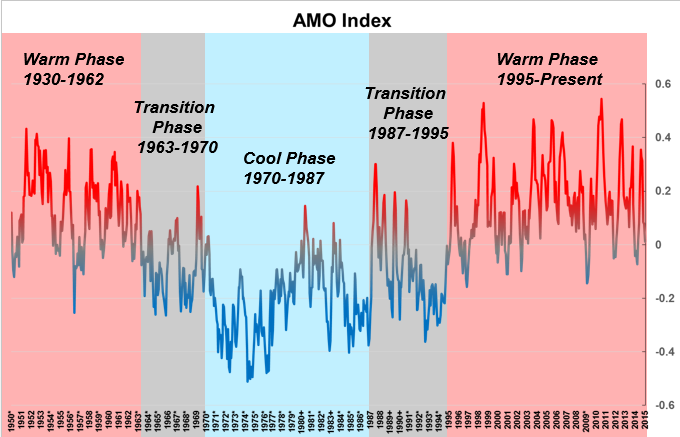 The oscillatory mode, mostly representing the AMO, was responsible for about 72% of the entire contiguous U.S. temperature increase over that time span with the contribution varying from 86 to 42% for individual climate regions. -PDO began in the late 40's and last until the late 70's. So independently, which Index correlates better? Or do we need to look at both?